I shall never forget my first interview with this great man. I was accompanied to the executive mansion and introduced to President Lincoln by Senator [Samuel] Pomeroy. The room in which he received visitors was the one now used by the President's secretaries. I entered it with a moderate estimate of my own consequence, and yet there was to talk with, and even to advise, the head man of a great nation. Happily for me, there was no vain pomp and ceremony about him. 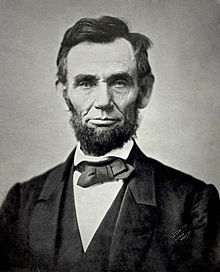 I was never more quickly or more completely put at ease in the presence of a great man, than in that of Abraham Lincoln. He was seated, when I entered, in a low arm chair, with his feet extended to the floor, surrounded by a large number of documents, and several busy secretaries. The room bore the marks of business, and the persons in it, the president included, appeared to be much overworked and tired. Long lines of care were already deeply written on Mr. Lincoln's brow, and his strong face, full of earnestness, lighted up as soon as my name was mentioned. As I approached and was introduced to him, he rose and extended his hand, and bade me welcome. I at once felt myself in the present of an honest man — on whom I could love, honor and trust without reserve or doubt. Proceeding to tell him who I was, and what I was doing, he promptly, but kindly, stopped me, saying, 'I know who you are, Mr. Douglass; Mr. Seward has told me all about you. Sit down. I am glad to see you.' I then told him the object of my visit; that I was assisting to raise colored troops; that several months before I had been very successful in getting men to enlist, but now it was not easy to induce the colored me to enter the service, because there was a feeling among them that the government did not deal fairly with them in several respects. Mr. Lincoln asked me to state particulars. I replied that there were three particulars which I wished to bring to his attention. First that colored soldiers ought to receive the same wages as those paid to white soldiers. Second, that colored soldiers ought to receive the same protection when taken prisoners, and be exchanged as readily, and on the same terms, as any other prisoners, and if Jefferson Davis should shoot or hang colored soldiers in cold blood, the United States government should retaliate in kind and degree without delay upon Confederate prisoners in its hands. Third, when colored soldiers, seeking the 'bauble-reputation at the cannon's mouth,' performed great and uncommon service on the battlefield, they should be rewarded by distinction and promotion, precisely as white soldiers are rewarded for like services. The increasing opposition to the war, in the North, and the mad cry against it, because it was being made an abolition war, alarmed Mr. Lincoln, and made him apprehensive that a peace might be forced upon him which would leave still in slavery all who had not come within our lines. What he wanted was to make his Proclamation as effective as possible in the event of such a peace. He said in a regretful tone, 'The slaves are not coming so rapidly and so numerously to us as I had hoped.' I replied that the slaveholders knew how to keep such things from their slaves, and probably very few knew of his Proclamation. 'Well,' he said, 'I want you to set about devising some means of making them acquainted with it, and for bringing them into our lines. He spoke with great earnestness and much solicitude, and seemed troubled by the attitude of Mr. Greeley, and the growing impatience there was being manifested through the North at the war. He said he was being accused of protracting the war beyond its legitimate object, and of failing to make peace, when he might have done so to advantage. He was afraid of what might come of all these complaints, but was persuaded that no solid and lasting peace could come short of absolute submission on the part of the rebels, and he was not for giving them rest by futile conferences at Niagara Falls, or elsewhere, with unauthorized persons. He saw the danger of premature peace, and, like a thoughtful and sagacious man as he was, he wished to provide means of rendering such consummation as harmless as possible. I was the more impressed by his benevolent consideration because he before said, in answer to the peace clamor, that his object was to save the Union, and to do so with or without slavery. What he said on this day showed a deeper moral conviction against slavery than I had even seen before in anything spoken or written by him. I listened with the deepest interest and profoundest satisfaction, and, at his suggestion, agreed to undertake the organizing of a band of scouts, composed of colored men, whose business should be somewhat after the original plan of John Brown, to go into the rebel states, beyond the lines of our armies, and carry the news of emancipation, and urge the slaves to come within our boundaries. For the first time in my life, and I suppose the first time in any colored man's life, I attended the reception of President Lincoln on the evening of the inauguration. As I approached the door, I was seized by two policemen and forbidden to enter. I said to them that they were mistaken entirely in what they were doing, that if Mr. Lincoln knew that I was at the door he would order my admission, and I bolted in by them. On the inside, I was taken charge of by two other policemen, to be conducted as I supposed to the President, but instead of that they were conducting me out the window on a plank. He rushed in to President Lincoln, and almost in less than half a minute I was invited into the East Room of the White House. A perfect sea of beauty and elegance, too, it was. The ladies were in very fine attire, and Mrs. Lincoln was standing there. I could not have been more than ten feet from him when Mr. Lincoln saw me; his countenance lighted up, and he said in a voice which was heard all around; 'Here comes my friend Douglass.' As I approached him he reached out his hand, gave me a cordial shake, and said: 'Douglass, I saw you in the crowd today listening to my inaugural address. There is no man's opinion that I value more than yours; what do you think of it?' I said: 'Mr. Lincoln, I cannot stop here to talk with you, as there are thousands waiting to shake you by the hand'; but he said again: 'What did you think of it?' I said: 'Mr. Lincoln, it was a sacred effort,' and then I walked off. 'I am glad you liked it,' he said. That was the last time I saw him to speak with him. Allen Thorndike Rice, editor, Reminiscences of Abraham Lincoln by Distinguished Men of His Time, pp. 191-193. 1st Let a general agt. be appointed by your Excellency charged with the duty of giving effect to your idea as indicated above: Let him have the means and power to employ twenty or twenty five good men, having the cause at heart, to act as his agents: 2d Let these Agents which shall be selected by him, have permission to visit such points at the front as are most accessible to large bodies of slaves in the Rebel States: Let each of the said agts have power — to appoint one subagent or more in the locality where he may be required to operate: the said sub agent shall be thoroughly acquainted with the country — and well instructed as to the representations he is to make to the slaves: — but his chief duty will be to conduct such squads of slaves as he may be able to collect, safely within the Loyal lines: Let the sub agents for this service be paid a sum not exceeding two dolls— per day while upon active duty. 3dly In order that these agents shall not be arrested or impeded in their work — let them be properly ordered to report to the General Commanding the several Departments they may visit, and receive from them permission to pursue their vocation unmolested. 4th Let provision be made that the slaves or Freed men thus brought within our lines shall receive subsistence until such of them as are fit shall enter the service of the Country or be otherwise employed and provided for: 5thly Let each agent appointed by the General agent be required to keep a strict acct of all his transactions, — of all monies recieved [sic] and paid out, of the numbers and the names of slaves brought into our lines under his auspices, of the plantations visited, and of everything properly connected with the prosecution of his work, and let him be required to make full reports of his proceedings — at least, once a fortnight to the General Agent. This is but an imperfect outline of the plan — but I think it enough to give your Excellency an Idea of how the desirable work shall be executed.